The centerpiece of the forum was the unveiling of a Chicago Agreement on Climate and Community. The agreement outlines a set of principles and commitments by the city’s neighborhoods, institutions, and organizations to curb climate change. Just as the Paris Agreement facilitates collaboration among nations of the world, the Chicago Agreement offers a way for community members and local organizations to contribute to practical climate solutions. Members of the Green Community Connections/One Earth Film Festival leadership team helped conceive and plan the Climate Forum, which took place on the eve of the North American Climate Summit organized by the Global Covenant of Mayors for Climate Change and Energy. Mayors from around the world convened in Chicago Dec. 4-5 to discuss municipal commitments to the Paris Agreement to curb climate change. The forum was, in part, a response by Chicago environmental advocates to plans by the U.S. to withdraw from the Paris Agreement. They decided to mobilize and convene discussions for taking local action. Planners spent about seven weeks pulling together funders, speakers and a guest list. When RSVPs surged beyond expectations, the planning team had to request a larger space within the cavernous museum. Generous support for the forum came from the John D. and Catherine T. MacArthur Foundation. Based in Chicago, MacArthur is one of the nation's largest independent foundations. Since 2014, the foundation has made $200 million in grants to accelerate climate response and bring new voices to the fore. In opening remarks, Julia Stasch, MacArthur president, said cities, like Chicago, are on the front lines of climate action. “Cities represent climate vulnerability, but also opportunity,” Stasch said, noting that 54 percent of the world's population lives in cities. In his remarks, Chris Wheat, chief sustainability officer for the City of Chicago, referenced climate change’s “disproportionate impact on certain communities” and the need for intersectionality when creating policy. Newspaper columnist, political analyst and Field Museum trustee Laura Washington was the evening’s mistress of ceremonies. 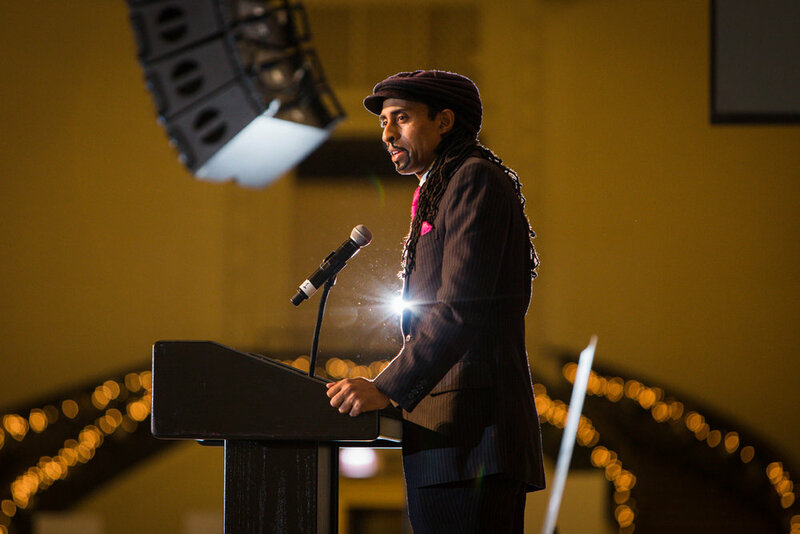 Following Ali, who has trained more than 4,000 people across the country in environmental justice techniques, was a panel comprised of local environmental activists, including Goldtooth. One of the panelists, Anthena Gore, a project coordinator with Elevate Energy, shared a painful and personal story centered on environmental justice issues. She recounted being diagnosed with lead poisoning when she was 2 years old and how her family dealt with the expensive hospital bills. Gore finished by asking: "Who is the two year old you are trying to reach today?" The youth dance and spoken word ensemble Kuumba Lynx ended the program with a performance of their “Black B4 Green” production, a powerful commentary on racial and environmental injustice. The program also included a short video featuring voice from a cross-section of Chicago’s environmental activism community. A reception featuring food and music rounded out the evening, with interactive “Co-Lab” (collaborative) spaces set up that fostered dialogue, learning and networking, along with tools and resources to help people start taking action on climate change. In all, a festive air characterized the event, even focused as it was on the serious issue of climate change. Laura Derks, a member of the Green Community Connections/One Earth Film Festival’s Core Team, had spent many hours helping plan the forum. As she surveyed the crowd of over 1,000, she reflected that the intensive work of creating such an unprecedented event was worth it.